Superchrome, one of the most popular digital large format printing companies in the UK, offers you specialized photos printed on canvas service. Our photos printed on canvas services are characterized by high clarity, cost effectiveness and speedy service. Superchrome has well experienced and highly professionalized employees to take care of all printing assignments. 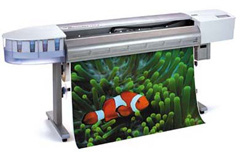 Using highly advanced digital printing technology, we print the photos on to a variety of canvases. We accept your own photos for printing. We also have a well organized photo gallery from which our customers can select appropriate photos if required. Superchrome has earned a reputation for producing some of the finest masterpieces in the field of photo printing on canvas. Our photos printed on canvas are distinguished by supreme color combination and highly defined images. We use high quality inks and advanced printing devices for facilitating our photos printed on canvas services. The canvases we use are weatherproof and waterproof and are therefore guaranteed a long life. We generally use the lightweight poly-cotton white artist's canvas and heavy weight waterproof canvas. Superchrome photos printed on canvas strictly cater to customer requirements and we provide the printed photos within the prescribed time frame. We maintain long term customer relations and our professionals render 24-hour customer services. Our online and offline services are of great advantage to our customers. If you wish to know more about Superchrome photos printed on canvas services, please contact us through e-mail or give us a call at our toll free telephone number. Contact us at 020 7237 9333 or fax 020 7237 9444 or email sales@superchrome.co.uk. Our experienced personnel would be able to guide you appropriately.